If you have an iPhone, hopping on a wi-fi network is good when you want to connect to an AirPlay device, or wi-fi based storage device, or save some battery. But if the actually internet connection is really crappy or non-existent, that means you're essentially cut off from the world (unless you're trying to talk). 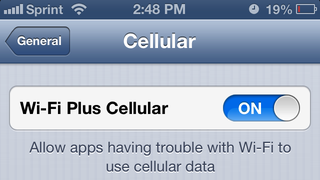 But a new feature discovered by Apple Insider in the latest iOS 6 beta fixes that.